While these stays were worn for a specific scene, it is a really interesting look at how the bodices in general seem to have worked. It’s very modern in some aspects but not in others. So while not historically accurate in any way, it winds up as an interesting insight into Hollywood being creative, and also using the techniques they had. Front and back. The front uses the same seam placement as on the bodices for Norma, with two long lines over the bust, and straight seams from side around the back. The very large unboned tabs look functionless but have given me an idea- they would help protect pressure from the weight of the skirt around the waist- like real tabs in real stays through the 16th-18thC. I am not sure what kind of stays I do want to wear but I will be wearing something to pad my upper hips as I know too well the pressure of skirts right there. 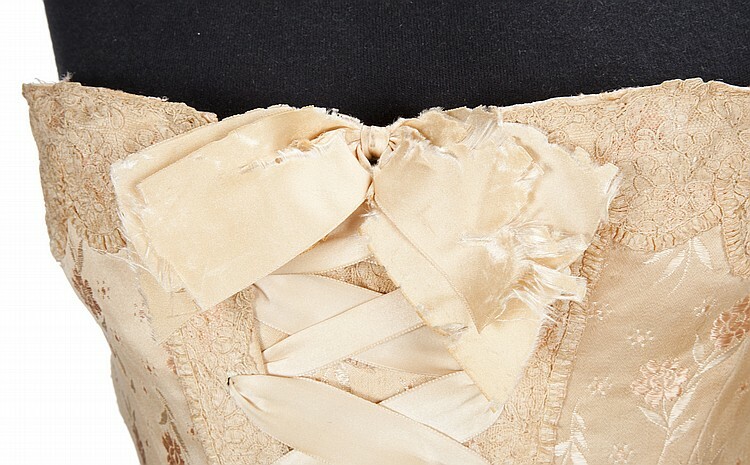 These details feel modernly vintage- that lovely ruched ribbon work around the edges especially. Next Next post: voting? voting!